Pain is usually defined as an unpleasant sensory and emotional experience associated with actual or potential tissue damage, so pain serves as an important mechanism to prevent injury. The sense of pain occurs as the brain’s response to input from the periphery. Electrical and chemical changes that appear because of an injury, disease or damage to the body are conducted centrally by means of a whole array of ion channels, some initiate the stimulus, some conduct electrically and some transmit chemically across synapses. There are two basic types of pain: neuropathic (nerve injury) pain and nociceptive (tissue) pain. Neuropathic pain is caused by a primary lesion or dysfunction in the nervous system and it lasts long after healing of the damaged tissues and can turn into chronic pain. The nociceptive pain occurs when nociceptors are substance stimulated by damaged or inflamed tissue. The pain is usually time limited and serves a protective purpose. 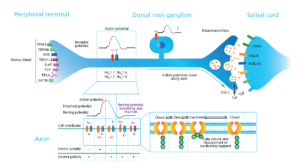 There are many examples of ion channels involved in pain and they play different roles. Voltage gated Na+ channels are important for conduction along afferent nerve fibers, voltage gated Ca2+ channels are important for releasing neurotransmitters in the synaptic cleft and transient receptor potential ion channels (TRP), acid-sensing ion channels (ASIC), glutamate receptors (KA, NMDA and AMPA ligand gated ion channels) are involved in the primary response at the free terminals placed under the skin. Year: 2019 First author: Sauter et Al. Year: 2018 First author: Klint et Al. Year: 2018 First author: Bankar et Al. Year: 2018 First author: Goncalves et Al. Year: 2017 First author: von Schoubye et Al. Year: 2018 First author: Israel et Al. Year: 2014 First author: McPate et Al.